This rich, atmospheric painting of the Trianon chateau is characteristic of Henri Le Sidaner’s poetic images of Versailles which earned the artist the title of ‘le peintre de Versailles’ from his biographer Camille Mauclair. Having studied painting in Paris at the atelier of Alexandre Cabanel and then the École Nationale des Beaux-Arts, Le Sidaner moved to the small village of Versailles just outside of the city in 1903 with his wife-to-be Camille and was soon enamoured with scenes of its gardens and architecture. In this particular example from the acclaimed series of works from Versailles, Le Sidaner turns his attention to Trianon, the chateau built by Louis XIV as a retreat for the King and his mistress the Marquise de Montespan away from the Royal Court. Much like Monet and the idyllic water lilies at Giverny, Le Sidaner’s departure to Versailles stimulated a fresh interest in the effects of light and rhythms of the natural world for the artist. In ‘Petite porte de Trianon, Versailles’ Le Sidaner describes the nuances of the bright afternoon sun filtering through the tree branches through a medley of harmonious greens and yellows against contrasting marks of purple. 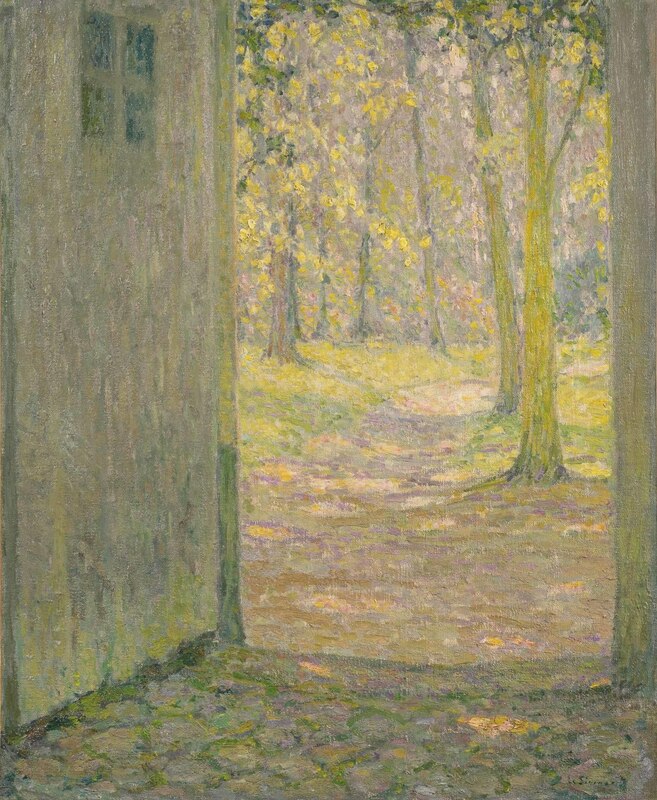 Leading the viewer through an open door to the cobbled path and forest surrounding the chateau, Le Sidaner is also able to express the tranquillity of provincial life and the hint of a recent human presence. “His entire work is influenced by a taste for the tender, soft and silent atmospheres”, fellow artist Paul Signac famously commented. “Gradually he even went so far as to eliminate from his paintings all human figures, as if he feared the slightest human form might disturb their muffled silence.” Focusing upon ‘inner life’, Le Sidaner’s image of the open chateau door forges a unique meditative style that combines soft Impressionist brushstrokes with the mysterious atmosphere of his early Symbolist canvases. ‘Petite porte de Trianon, Versailles’ was first handled by the influential art dealer Georges Petit in Paris, who represented Le Sidaner from 1899 to 1933 before being consigned to Knoedler & Co. in New York. From America, the painting was sold to Brigadier General Samuel McRoberts, Vice President of the National City Bank of New York to be housed in his mansion The Ledges in Westchester County. Following McRoberts’s death in 1948 his entire estate was purchased by the Swedish shipping magnate Sven Salen. The painting was gifted to a friend in 1949 and remained in that family’s collection until we purchased it from the Estate sale of one of their descendants.